Maureen has lived in her house for over 70 years and grew up in the village atmosphere of New Malden. She married local lad, Bob (who was born in Northcote Road) and, as she says, " I have never felt the need to move away!" Joan grew up in New Malden and married Derick in 1960, and has lived locally with their three children. She has enjoyed working at various day centres for the elderly as care staff for over 26 years and considers it "the most rewarding job ever". Since retiring from Amy Woodgate Day Centre she now attends and assists as a volunteer and she also helps at the 1st Malden Beaver Company. Robin is presently the Secretary of the Society. He has lived in Malden since 1958, and has a keen interest in the local history of the area, initially Old Malden where he lives, but now encompassing New Malden and Coombe. He has been writing history articles for The Village Voice (Malden's community magazine) since 2006, and still finds facts that many people were unaware of in our local community. Martin started attending New Malden Baptist Church as a child in Nov 1949. Martin has lived in Raynes Park and in Kingston borough since 1974 and married in March 1986. Martin is now retired but was previously operations Control Manager with South West Trains. At present he is a volunteer with the Metropolitan Police (front counter) at New Malden, a marriage Registrar at New Malden Baptist Church and a member of the NMBC Building management team. Martin has been involved with “The Boys’ Brigade“ since 1954. Julian is currently overseeing our initial project, Recollections. He has lived in New Malden for 37 years, is a Chartered Building Services Consultant and his interests include local history (as he is a qualified Kingston Tour Guide), personal history, (as he researches his and other’ family histories) and the history of London. In 2014 he became a published author with his book 'Secret Kingston upon Thames' and followed this, in 2017, with " Kingston upon Thames in 50 Buildings". He also compiled the Society's book of Recollections "Monday was always Washday" and wrote 'We knew you were coming!" , the Society's book telling the stories of the three New Malden Victoria Cross recipients. He is the Society’s archivist and looks after the website - when he can! Graeme Hodge was born in Parson’s Green and raised in Wimbledon Park. Graeme is married to Karen and they have one son, Michael. They have lived in New Malden since 1989, firstly in the Groves and now in Old Malden. Graeme is currently Head of Learning Resources at Nescot College where he has worked for the past 25 years. 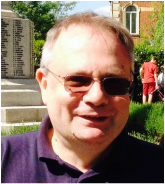 Graeme is particularly interested in local, social and military history and is currently researching war memorials in the Maldens and Coombe and Kingston as well as looking at the impact of both World Wars on our local community. He is Vice-Chair of the Royal Borough of Kingston War Memorials Association and a member of the Western Front Association.